We know if this is your first time looking into dance, all of these class names can get confusing. So we put this page together to help you understand what classes we offer, what the different styles of dance are, and what kind of expectations we have for our dancers as they advance through our levels. 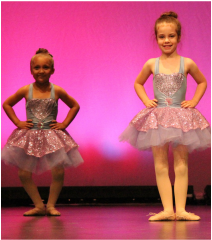 Combo classes for 3-4 year olds focus more on learning gross motor sills and proper classroom behavior while 5-6 year old classes focus on perfecting those skills an moving on to more complex dance moves commonly found in the style of dance they are learning. Our beginning ballet classes are structured to give our students a fun introduction to the world of classical ballet. Our teachers have learned many different styles and incorporate the best of what they have learned into their classes. ​All classes strive to teach proper ballet class etiquette as well as proper ballet technique. ​Jazz is a dance style that has been developing into new and interesting iterations in the past few years. Our jazz classes are centered around classical jazz technique which allows for the leaps, turns, and tricks that wow audiences. When choreographing dances, we encourage our teachers to introduce our dancers to all sorts of jazz styles including Broadway/musical theater, jazz funk, character, classical jazz, and anything else they can think of that uses the core jazz technique that they have been teaching throughout the year so our dancers can gain experience throughout the years in different performance styles. 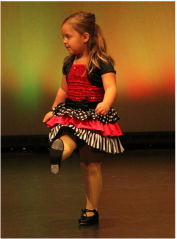 Tap is a dance form that teaches rhythm and musicality through the use of fine motor skills, coordination, and balance. 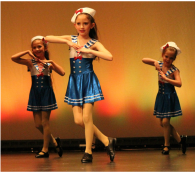 Our classes aim to provide our dancers with the ability to learn combinations of classical tap steps from the dance style's rich history as well as allowing the dancer to develop an understanding of timing and the aesthetics of sound and how they are used in modern tap dancing. Contemporary is a hard style to explain. This dance style has been one of the fastest evolving styles of the past few years. Starting out as a natural movement alternative to Ballet, modern was the jumping off point for dancers to express themselves through dance in a way that Ballet didn't allow. Lyrical soon followed as songs with lyrics, rather than the classical instrumental songs of ballet, were used to choreograph emotional and expressive dances. Now we have moved on to the name contemporary and this, depending on who you ask, can encompass a great variety of different dance styles. Our contemporary classes aim to teach our dancers how to listen to music and find an emotional connection to it in order to share that emotion with their audience. 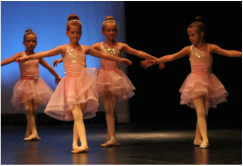 Classes will spend about half of their time on technique and steps that are not used in ballet or jazz and the other half of their time is used to learn and perfect recital dances. Because performance is a huge aspect of contemporary we require dancers to also take a ballet or jazz class so contemporary class time can be used more to develop our dancers' artistry. Pre-Pointe is a new class to our studio this year. It is an hour long class in regular ballet shoes that is designed to teach dancers what they need to focus on if they would like to continue their ballet training on pointe. Class time will be spent teaching dancers what muscles must be strengthened and what technique is essential to going on pointe, putting that knowledge to work at the barre. This class is open to dancers 9 and up but please be aware, pointe-work is very hard on the body and in order to protect our dancers, it is very rare for a dancer to start pointe until she is at least 11. 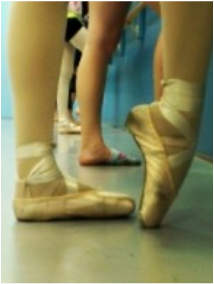 Pointe is simply the continuation of ballet technique. Once a dancer has developed solid ballet technique, she is eligible to be considered for pointe. Dancers will spend some time in regular ballet shoes warming up as they would in a ballet class and then they will put on their pointe shoes and continue their ballet training on their toes. This is the style that comes to mind when someone says "Ballerina" but it is not a step to take lightly. When deciding to begin pointe work it is important to understand the physical demands of the class. If you are interested in beginning pointe, please ask your ballet teacher and honor their opinion. Pointe can be a very dangerous dance style when not approached with caution and experienced support. Classes for students 9 and older are given a level between 1 and 3. 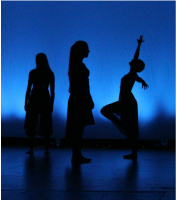 ​Levels are not indicative of years in dance, they reflect the skills that dancers master as they grow at our studio. 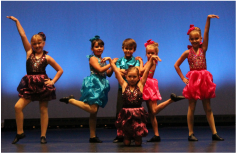 Level one classes are where all of our dancers begin. 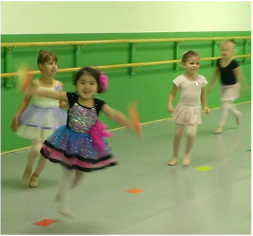 Basic technique and dance steps are taught and perfected in level 1 classes. ​A dancer will typically stay in level 1 for 2-3 years before moving up to level 2. Level 2 classes build on the technique taught in level 1. Without the foundation of level 1 students will not be able to progress as quickly and can find themselves frustrated at the difficulty of the steps in level 2. ​A dancer will typically stay in level 2 for 2-3 years. Level 3 classes continue to build on the technique and steps taught in levels 1 and 2. ​Level 3 is currently our highest level of dance. Students in this class have generally been dancing for about 5 years and have mastered the steps being taught in levels 1 and 2.